Big John was born and raised in around the Dallas Fort Worth Texas area. He learned to bar-b-que in his high school years. Around 1975 John’s father owned a furniture store right across the street from the world famous Louie Mueller Barbecue in Taylor, Tx. 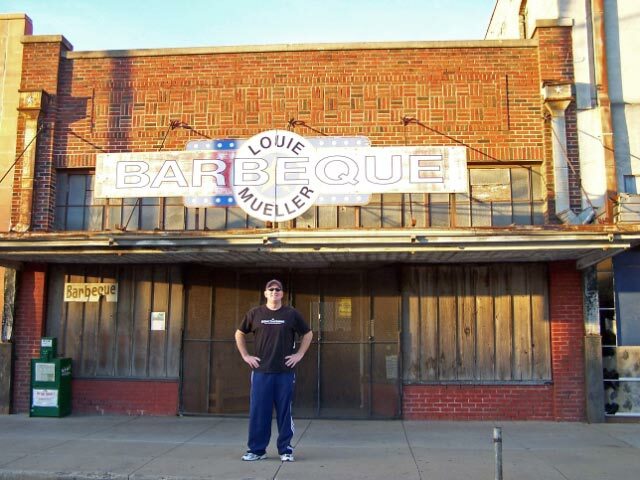 John would often hang out at Louie Mueller’s observing how they carefully cooked their award winning BBQ. John was invited to be a BBQ sauce judge at the Taylor International BBQ cook-off. He really enjoyed being in the BBQ cook-off arena and started to really hone in on his BBQ cooking skills. Brisket and ribs were his specialty. He learned that with BBQ, slow and low is the key to great, tender mouthwatering meat. A simple rub and cooking with love are also an important ingredient to great BBQ. Big John’s Texas BBQ was started in Arizona in 2006 because in Arizona you could not find authentic Texas BBQ. Big John started out going to events with a pop-up tent and a Big John’s Texas BBQ banner. Everywhere he went, he would sell out. He finally decided to invest in a custom BBQ trailer. The BBQ trailer has allowed Big John to travel all over Arizona and California for BBQ events and cook-off’s. Big John now has an old gas station turned BBQ restaurant in Page, AZ. His customers constantly comment on how they think his BBQ is wonderful and how it is so awesome to get real Texas BBQ (even homemade sweet tea!) in Arizona. “Big John’s Texas BBQ, a little taste of Texas in Arizona”. Tayor, Texas – Louie Mueller’s TX BBQ where Big John got his start! Friend us on FaceBook and get updates on our specials and events.